Happy Walpergis Night and May Day! 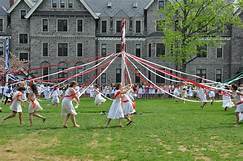 Walpergis Night- May Eve is April 30th; May 1st is May Day. 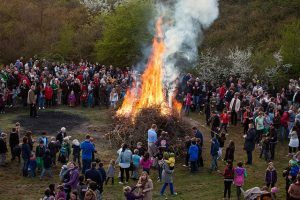 Many Pagans get together to show solidarity with each other and our ancestors by building bonfires, and dancing around May Poles. Some remember that, as at Samhain, the veil is thin at this point in the yearly cycle, and it’s easier for our ancestors to visit this side. In Ancient Rome the Lemuria was held for three days in May. The family ancestors would be welcomed and fed, but then at the end (on the 13th) they would be sent away by tossing beans around the house and saying: “I send these; with these beans I redeem me and mine” (Haec ego mitto; his redimo meque meosque fabis.) nine times. As with live relatives, sometimes we are glad to have them, sometimes we are glad to have them leave. While the benevolent dead became Manes or household spirits, the malevolent dead became lemures, spirits who would harm the living. These are the ones they wanted to banish. 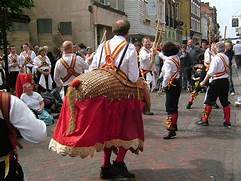 In Northern Europe towns would erect May Poles and dance around them, and we still recreate the old ways- the dancing, the plays, with the hobby horse and Greenman. We welcome the coming growing season and the cycle of change, while at the same time, trying to connect with the past. We no longer drive our cattle between two bonfires (or at least I don’t know anyone who does, there may be some who do), but we do recognize the need to purify as well as celebrate, to break with those parts of the past we want to let go, while holding onto the ones we love. Change usually includes choice, and sometimes taking responsibility for those choices is the hardest part of change. So let’s celebrate when we can, and enjoy the company of others who know what a magickal time this is! This entry was posted in Theme images Sundays and tagged Beltane, change, cycles, divination, holidays, ritual, Witch. 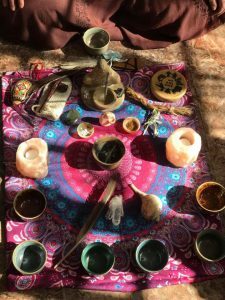 ~join Willow for a magical session involving ceremonial raw cacao, meditation, drumming, song healing and connection. 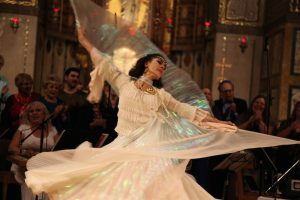 People who attend these ceremonies notice that in the days that follow, blockages in their lives shift, powerful synchronicities occur and even deep healings take place. All with the help of some delicious chocolate! • A blanket to stay warm – when journeying it can get a little chilly! • Something to cover your eyes with (like a scarf or handkerchief) to block out the light and help you turn your focus within. Cacao is the heart’s “blood” due to its relatively high levels of magnesium, antioxidants, and love associated chemicals, making it truly a “food for the heart”. The medical and scientific buzz about chocolate began with studies of the Kuna, a group of indigenous islanders whose high-salt diet did not lead to high blood pressure. The early studies determined that Cacao was the cause, not genetics – the Kuna drink about an ounce (28 gm) of Cacao a day. With Cacao, the heartbeat becomes pronounced, breathing is deepened and nourishing blood circulation is increased throughout the body. This increases physical and mental energy and endurance, arousing the senses and heightened awareness. Pure Cacao has recently been found to contain high levels of antioxidant polyphenols, oligomeric procynanidins and other flavonoids that help boost the immune system and offer significant protection against “bad” cholesterol and heart disease. It is also very nutritious, having a high protein content and is reported to be the richest natural source for magnesium, an important mineral highly deficient in modern diets. The raw seeds are also surprisingly high in vitamin C and an excellent source of natural sulfur, a mineral associated with healthy skin, nails, hair and proper liver and pancreas function. There is also much in the scientific literature about how Cacao not only lowers bad cholesterol and raises good cholesterol, but how it increases blood-flow to the brain which may delay dementias like Alzheimer’s, and about Cacao as a heavy metal chelator, binding and removing them from the body. While the medical profession is suggesting that people eat dark chocolate, they don’t mention that most of the chocolate available lacks the essential components that are in the type of Cacao that much of the research was done with. We think of our cacao as a plant medicine. Like any potent medicine, it is important to be mindful in its use. In most cases, there are no concerns to be aware of. The pieces listed below are mainly a concern in higher doses, like when we use the cacao ceremonially. In these cases, the combination of potent cacao and a higher dose warrants some additional mindfulness. Cacao is a strong bitter and power detoxifier as it helps cleanse the liver. Because of this, in higher doses people might experience detox symptoms such as headache or nausea. In this case, take it as a blessing and drink plenty of water as your body lets go of whatever it didn’t like. This will likely be accentuated for people on a raw diet or who are fasting. Go with lower doses in this case. Many anti-depressants are contra-indicated with the tryptophan and MAO inhibitors in this cacao, so we recommend checking your meds first. Again, this is because our cacao is more potent to begin with and often taken in higher doses. Chocolate doesn’t have enough strength to cause these effects. Worst case scenario is headache and nausea, but avoid the hassle and do research first. Serious heart conditions. The theobromine in cacao increases heart rate significantly and is a vasodilator, lowering blood pressure. If you have such a condition, go lighter on amounts. This entry was posted in Saturdays Classes and tagged Cacao, ceremony, chocolate, ritual, WIllow Diana. Please join Tchipakkan and her guest AVee Baron on the New Normal 8 pm Wednesday, October 4, 2017, 8-9 p.m. edt. We’ll be talking about Ancestors. 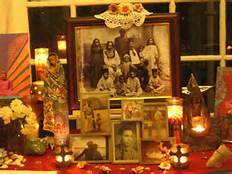 Most cultures have some version of ancestor veneration, where the spirits of their beloved dead aid them in their lives. Even modern folk sometimes feel in touch with our relatives. Mediums and Spiritualists assure us that they watch over us and tweak reality to help us as they can. As with most forms of mind-to-mind (soul-to-soul) contact, frequent interaction makes it easier to communicate. Rituals, offerings, keeping an altar all help, and this time of year (approaching Samhain/Halloween) is one where many feel closest to their ancestors. This year at the Changing Times-Changing Worlds conference, my guest AVee Baron will be running an Ancestor Ritual (as well as teaching Cartomancy). AVee is a pagan who has practiced new age, Buddhism, Wicca and Witchcraft. 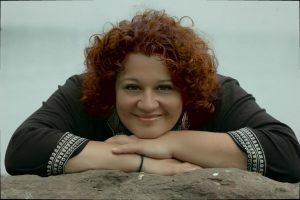 She’s a Reverend in the Correllian Tradition, speaks and teache on many subjects, and owns Witchy Spellz N Wares occult online shop in Connecticut. She also has several other pages and web sites for different purposes. Witchy Spellz N Wares, for products and spell services. : http://witchyspellzandwares.wixsite.com/viatrixsage. Sage Willow and Horn University- Studies in in Paganism and Witchcraft covers online or in person eclectic study courses. Babalon Shrine Scarlet Woman is a Thelemic and related page; the Shrine of the Mystical Stag Group. The Witchy Spellz N Wares Page lists my working services and products. Listen on your computer: Open a window on your computer to www.Liveparanormal.com, click the “Listen Live and Chat” listing under the “radio-listen/chat room” heading, and click “LISTEN HERE” next to “the New Normal”. We’d love you to phone in with questions: 619-639-4606 (live only). If you know you’re going to listen later but have a question, look on the facebook events page and leave a question there. We’ll try to answer it during the show. This entry was posted in Tuesdays New Normal announcements and tagged Ancestors, AVee Baron, ghosts, ritual, speaker, spirits, tulpa, Witch. We begin with a discussion of just what differentiates ecstatic ritual from other types of ritual. What does ecstasy mean? How is an ecstatic experience defined and how is it integrated into ritual either by serendipity or ritual engineering? How do we raise energy? How do we move energy to create space for the natural human state of ecstasy? This entry was posted in Saturdays Classes and tagged Davis Sprague, Ecstatic, energy, magic, ritual. Complex Trauma-informed holistic modalities, ritual and practice. Don’t put a band aid on a gaping wound! Trauma fragments the self and conditions self-blame. Complex and sustained trauma conditions the brain in ways in which an individual may not be aware. People can “wake up” to their trauma history in their 50s and 60s after decades of consistent failure to thrive in their lives. This panel will discuss the most recent findings on how trauma affects the brain and the body. We will explore how holistic practitioners, ritualists and other practitioners can identify, support and modify modalities, ritual and practice to bring healing to complex trauma survivors. This entry was posted in Fridays Panels and tagged body, brain, delay, healers, healing, holistic, mind, ritual, trauma.